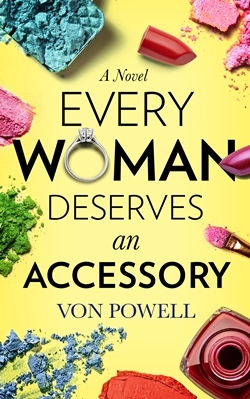 Featured Indie Book on Indie Author News: Adult Romantic Novel Every Woman Deserves an Accessory by Von Powell. Every Woman Deserves an Accessory chronicles the experiences of a personal trainer and celebrity makeup artist, who mix business with pleasure, and are left to deal with the consequences of their actions. The Book has been self-published via Amazon & CreateSpace and is available as eBook - 338 pages - released in November 2014. When Raquel Davis, a successful, but jaded makeup artist first heard about personal trainer Javier Vasquez, she wasn't interested. Her marriage was crumbling and her friendships were becoming destructive. Overweight and lacking confidence, Raquel wasn't ready or interested in meeting anyone new. Fast forward five years. Raquel is eighty pounds slimmer with much more confidence in herself. She has ended her marriage and traded in the flash of a diamond ring for the flashbulbs of the red carpet. But, despite all her material and career success, she wants something more. Raquel has survived heartbreak, handled single motherhood, and thrived in the world of fashion, but will she allow herself to take a chance on love again? Although she is now use to wearing diamonds only on her ears, perhaps Javier will be able to show Raquel an accessory or two that she’s been missing. She knew what she wanted. She knew what she needed. But she had no idea what she deserved. Von Powell has always been a writer; who recently started teaching. Growing up as an only child on Chicago's south side encouraged Von to use his creativity to have fun when it was too snowy and cold to go outside or too hot and violent to play with his friends. Thus, as a child to keep himself occupied, he would draw pictures and create short stories to go with them. Encouraged by his teachers, Von decided that maybe one day after he finished law school, it would be a good time to write. However, when the time came for Von to attend law school, he deferred his offers and committed to serving for two years as a Teach For America Corp member. While teaching, Von realized just how much he loved to connect with people's emotions and admittedly saw writing as a way to impact more lives. Von confesses that "not attending law school was one of the hardest decisions that I've had to make." Von turned down offers to attend law school in order to, "give back to others, especially young men who look like me and come from similar backgrounds." The national education program, Teach For America, allowed Von the forum for him to make it happen. Ultimately, serving others was one of the best decisions Von could have made for himself as he smiles and says, "Working with my students inspired me to do what I love and follow my dreams. They're a huge support system."